Compared to simple walking, you will experience: A FULL BODY WORKOUT! There are many different styles and qualities of Nordic walking poles. Some people are disappointed to learn that the poles they bring to my classes aren’t the best poles for them (ie: they’re noisy, difficult to adjust, locking system doesn’t hold, boot tips are too hard, straps are cumbersome etc.) Other people discover that they’ve purchased trekking/hiking poles, not Nordic walking poles. I suggest learning about Urban Poles by borrowing from me first. Then make an informed decision when you’re ready to buy. Please visit urban poling web site for more information. Urban Polars on the Move! You inspire us and help us to stay as active as possible as we enjoy this amazing journey. Being with the group adds an important social element too. 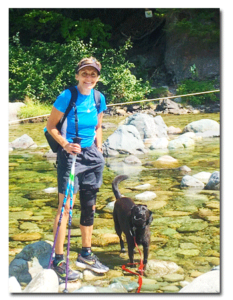 Urban Poling has helped my health enormously! Since I started poling, I can bend my knees properly. The osteoarthritis pain in my legs is gone and my breathing has improved. It is wonderful doing this activity with a group and I also enjoy doing it on my own. Urban poling and the classes are a pleasant, fun, relaxing, invigorating constant in my life that I am very grateful for! I love urban poling! It’s a great way to exercise and it’s a much better workout than just walking. I have bad knees and bad hips but I can do urban poling with no problem. It’s also great for my balance. And Kari is so enthusiastic and encouraging! I met Kari some two years ago at the Seniors Centre in Kingston while she was giving a demo of Urban Poling. I was so intrigued by this type of exercise and Kari’s open and bubbly personality that I joined her seniors group. Poling with Kari is a great but gentle workout in beautiful places under the careful and enthusiastic watch of Kari. This has to be the easiest way to do something healthy. Kari is a wonderful leader. Interested in getting active with me? Please send me a message with this contact form.